This comprehensive approach enables a more complete healing process that will prevent further injuries as well as speed up recovery between workouts. Athletes respond better when a coach is able to map out a specific workout. Similarly, doctors are able to map out and monitor specific plans that the athlete can follow. 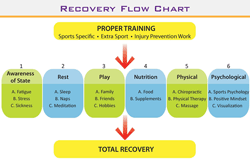 In addition, the athlete will become more aware of his/her recovery state and when he/she has fully recovered. The athlete can put that much more into his/her workouts which will ultimately improve the performance. Using monitoring techniques like Restwise, blood work, saliva testing that we have developed with traditional monitoring of heart rate the athlete will have the ability to measure how much they have recovered from a workout or sickness. It is no secret our bodies heal, recover and regenerate best during sleep…but how much? When is the best time? Are naps good? What about when you travel? These questions are all addressed under this pillar of recovery. 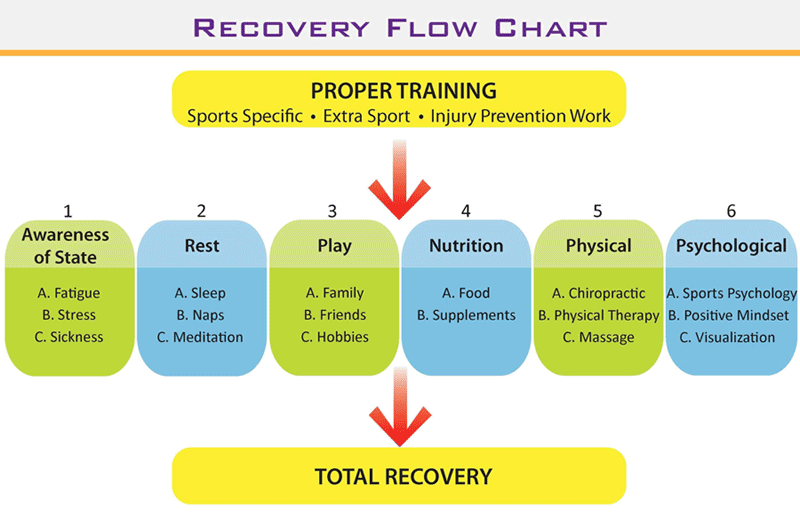 A structured training and recovery plan can be stressful. Maintaining focus indefinitely is impossible so we need to remember to add stress relievers such as family, friends, and laughter into our lives. Food and its importance with performance athletes is no secret, and the amount of information available in this area continues to grow. Supplements can also aid in recovery by reducing inflammation and free radical formation. Adding chiropractic, massage, yoga and physical therapy can make a huge difference with injury prevention and recovery. Moreover, maintaining proper biomechanics, muscle symmetry, and balance are essential. Methods such as positive affirmation, guided imagery, mental toughness and progressive relaxation techniques are a few ways to enhance and support the recovery process. In addition, the Rosa Rehab team also uses various testing methods to evaluate the athlete’s psychological state as it relates to recovery and performance.